Our property is called: SUNSET HILLS VACATION RENTAL Los Angeles. - Located off the famous Sunset Blvd, in the upscale "Sunset Plaza" multi-million $ neighborhood where you can safely walk the streets anytime. Within steps are famous restaurants, bars, comedy clubs, live music, shopping, celebrities & fantastic people watching. A spectacular architectural home with the best panoramic views of all of LA. This tranquil home is surrounded by lush garden life and its hard to believe that all the famous hot spots are just a stone throw away (5 minute walk). You'll have the luxury of sleeping in without the noisy Sunset Blvd., yet you can walk to the famous 'Sunset Strip', which is just two small residential streets away. The Sunset Strip neighborhood is home to famous restaurants such as: Katana, Koi, Boa, Eveleigh, Le Petit Four, Chateau Marmont, have sidewalk cafes; upscale boutiques for shopping such as Madison, Hugo Boss, Oliver Peoples, including famous nightlife, The Sky Bar, Bar Marmont, Whisky A Gogo and the Roxy. The centerpiece of the house being a stunning living room with B&B Italia modern couches, including a linked dining room with unbelievable jetliner views. Enjoy the extension of the living room being a wrap around balcony area by having dinner in the evening when the house is filled with sparkling city lights. There is seating in the balcony for 7 people with a round patio table. You can also pull out a couple of chairs for more of your friends. Home is equipped with WiFi and this is also a non-smoking home indoors. Has a private heated pool equipped with 7 chaise lounges by the pool and hot tub which is surrounded by lush garden life. The hot tub is located steps away under an alcove surrounded wall of ivy, which is perfect throughout the year. - Breathtaking views of all of the city along with its private balcony that has a futon so you may lay back and relax. - 600 thread count linens, & retractable blinds for privacy or afternoon siesta along with 4 closets. - Large walk-in bathroom with his and her sinks, a separate bathtub and separate shower. Equipped with a blow-dryer, iron, and iPod adapter alarm clock. - Queen bed with modern bedding and 600 thread count linens. - The rooms are also surrounded by a serene tree setting and have retractable blinds perfect for sleeping in. - Has seating area and the foot of the bed along with an extra chair. - Two closets with hangers and the 'Red' bathroom for this room is located steps away from the bedroom. - A queen bed with modern bedding and 600 thread count linens. The rooms are also surrounded by a serene tree setting. - Bathroom #2 for this room is located steps away from the bedroom. - 36' TV with over 800 channels and music. - Two large sliding closets with clothes hangers, 1 chair, 2 side tables with lamps. The very bright and earthy kitchen is fully equipped with new stainless steel kitchen appliances, 2 ovens, gas stove, dishwasher, microwave, coffee maker and is fully loaded with everything that you need to cook and eat with. It has a modern breakfast table, WIFI and DSL services. This floor has 2 rooms and two bathrooms with doors leading to Deck #1. The home has an elevator in which you go from both floors with. - 42' TV and with satellite channels, including music. - Additional closet and drawer space located in spacious bathroom area. - A queen bed with 600 thread count linens. The rooms window overlooks a serene lush setting. - Walk-in closet and private bathroom with shower and bath. 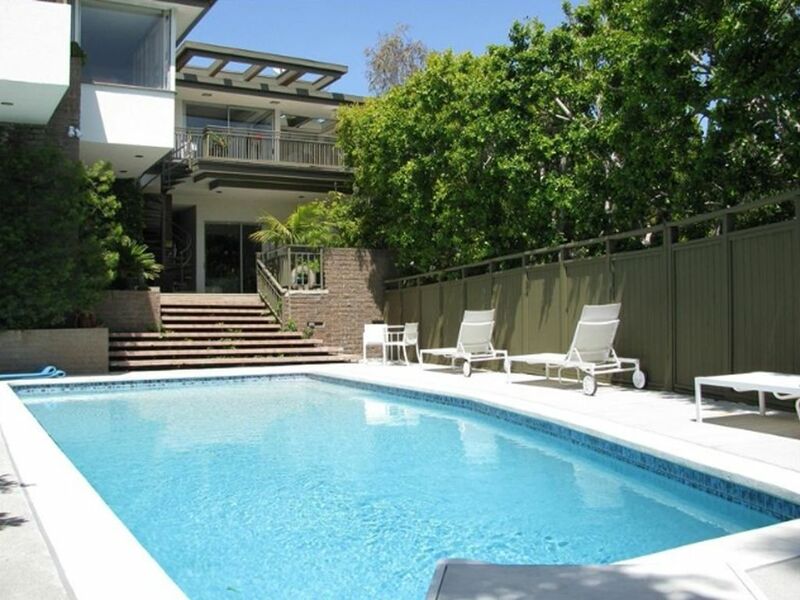 Located in West Hollywood, which is labeled as the 'upscale' luxury neighborhood of Los Angeles. Situated off the famous Sunset Blvd. 'SUNSET STRIP', on the beautiful Hollywood Hills on a quiet, private, secure street (just a few residential streets away from Sunset Blvd. - within 5 minute walking distance). Since the area is so quite you'd never know that just two blocks away is the famous Sunset Boulevard. Filled with sidewalk restaurants and cafes, the best upscale designer boutiques, legendary rock clubs such as, The Whisky A-Go-Go and The Roxy; trendy bars and dance clubs, including the Sky Bar and Key Club, Bar Marmont, Celebrity owned night spots such as The Viper Room, The famed Rainbow Bar and Grill, The Laugh Factory comedy club, The popular House of Blues and The Comedy Store. We love the West Hollywood area because of the fantastic food and vibrant nightlife. My husband and I live in Northern California now and this vacation home is inviting because it allows family and friends to gather and enjoy the city together and although the city life is exuberant, the home is surrounded by trees and life allowing for serenity when needed (as someone that lived in Los Angeles for 10 years, I know a home like this is hard to find!). We enjoy BBQ by the pool or walking down to the Sunset Strip and having brunch in the morning, sitting by the little cafes on the street and people watching. We like taking a drive down Sunset Blvd., which leads us to the beach and return home for a siesta. There is so much to see and do and this home is located in the central of all of it. It's a very safe, calm, and beautiful neighborhood - yet Sunset Blvd. is just a short walk away. Only Elevator to get to floors inside. Although there are 2 sets of stairs that also lead to downstairs from the outside. The house has 2 floors there is an elevator in the home. Access to the main floor is only possible by entering the carport and going up the elevator. This was a beautiful, clean and airy setting. It was in a perfect location. I traveled here with 7 other people - 2 adults and 6 kids. This was a perfect vacation getaway spot!! The house is awesome - it has everything you need. The pool was heated and the hot tub was great! Also, 4 of the kids are teens - so they enjoyed staying in the lower section away from the adults and two younger kids. The location was perfect for getting around. If you didn’t feel like going anywhere, then there was plenty of space to hang out in. I would highly recommend staying here. Claudia is the best, too! She is very responsive and easy to contact. We loved our time here! Beautiful spacious home. Loved every minute we were there! Sadly, this has been the most challenging client we have had in over 10 yrs. Myself, the caretaker, and pool man tried everything within our power to satisfy Jackie’s requests no matter the time of day and night. Please see the continued positive reviews before and right after her stay on our VRBO/Homeaway websites. Jackie first contacted me at 11:30 pm, I called her right away and said I would send our caretaker over first thing in the morning to spend as much time needed to help with her concerns. The caretakers have been with us for 10 years and they have yet failed to satisfy a client until now. They tried to find the soiled sheets, spiders/insects with no luck. It is quite important that the public know that the home DOES NOT have bed bugs, our mattress are purchased every 5 years and they have protective allergy covers. Our family (4 kids and hubby) vacation there often so its important to me that the house is well maintained. While the caretaker was on site, I called Jackie for the location of the soiled sheets and she said she did not know. She informed me the mothers checked out of the hotel and they left all of their 16 year old girls at the home. Her reservation stated 8 guests, but from reading this review, I guess there were 14 guests (13 guests is our contractual limit). The caretaker asked the girls about the location of the soiled sheets, the spiders, and all the other requests and they did not know. I asked the caretaker to clean the downstairs again as a precaution. 2 days later, I realized there wasn’t much more we could do to satisfy Jackie. I refunded her $430 and offered her the option to check-out. If she checked-out early I would reimburse her for any days/nights not used. I sent her links to 50 hotels/108 homes available in the area within the same price range. Jackie said I want to stay at the home and I also want a full refund (this was on Sunday, she was checking-out Wed.). She said she would contact VRBO and her credit card co. for a full refund in the case I wouldn’t give it to her. I told her no more money would be given to her if she continued to occupy the home. She involved VRBO’s legal team & customer service. VRBO did not find any malicious behavior on my part and told Jackie that the case was closed and nothing more could be done. This is the only client that has tried to extort a free stay from us in the last 10 years and we are truly disappointed that the matter ended this way. Spacious. Clean. Well stocked. Claudia was incredibly responsive and helpful. Would rent again. A beautiful house with pool in a great location! My extended family of 12 had an amazing time. The house was spacious with enough bedrooms and bathrooms for everyone. It was also in a great location in the Hollywood Hills. We enjoyed the pool and used it everyday. Claudia made herself available, but with her welcome kit it had everything you needed to know about the house and the area. I would definitely recommend this place. The house is located off the famous Sunset Boulevard in the upscale 'Sunset Plaza' neighborhood. The neighborhood is a quiet multi-million dollar area and you are safe to walk the streets day and night and enjoy the fantastic Sunset Plaza free of worries. Enjoy the peace and quite of having a home and the luxury of choosing your flavor of excitement on your watch. Known for its glamour, good times and rock and roll, the boulevard is the mile and a half stretch of Sunset between Hollywood and Beverly Hills that has been dubbed 'The Sunset Strip.' Running between Crescent Heights & Doheny Drive is 'Sunset Plaza', which embraces a premier collection of local rock clubs, chic sidewalk cafes for fantastic people watching, prime restaurants for the foodies, comedy for a happy soul, plenty of boutiques for the fashion conscious, different bars that fit your personality and much more... Please click on the Map above to see what is nearby.